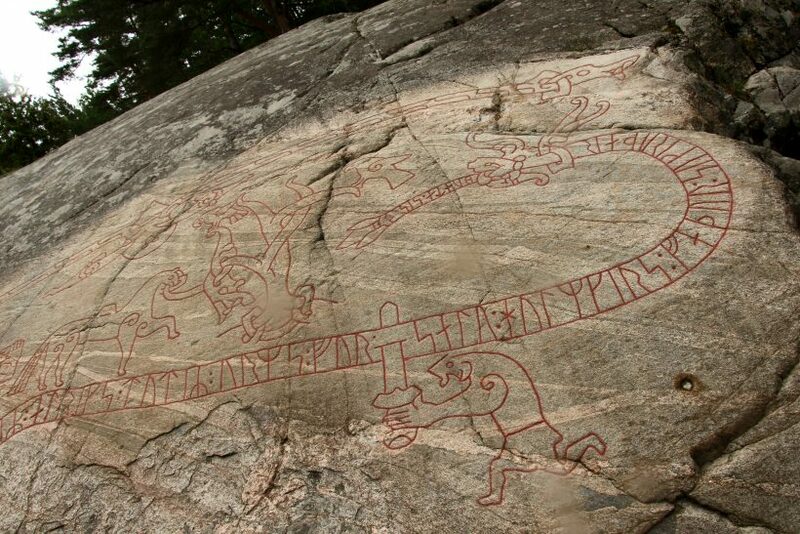 Carved into a rock face in the woods south of Lake Mälaren is one of the most impressive runic inscriptions in all of Scandinavia: Sigurdsristningen — literally the Sigurd Carving, but more commonly known in English as the Ramsund Carving. 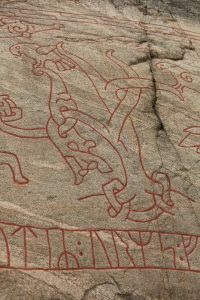 The carving dates from the 11th century A.D. and tells the story of Sigurd Fafnesbane (Fafnir’s Bane), a legendary hero who features prominently in Germanic mythology. 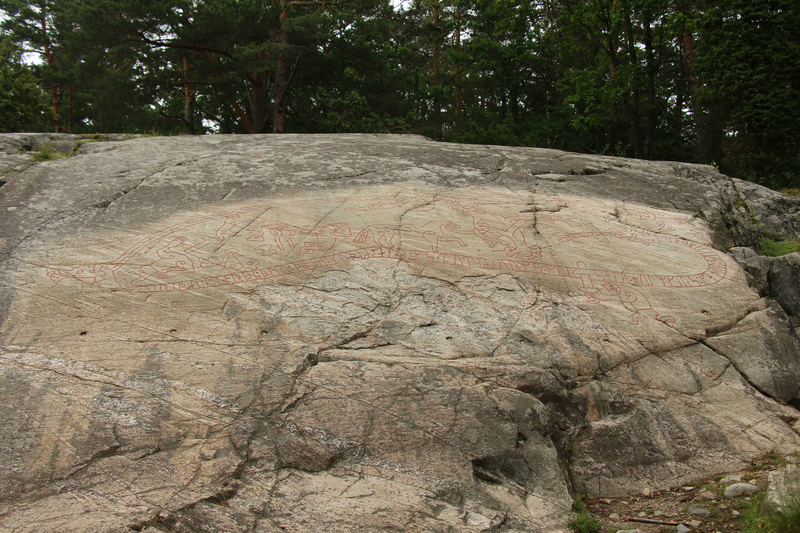 Five meters (16 feet) wide and two meters (6.5 feet) high, it’s the largest of Sweden’s thousands of runic carvings. A wooden copy of the Ramsund Carving, from 1877. 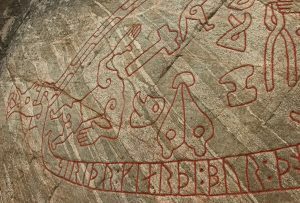 At the upper left of the carving is Otter with a ring in his mouth, representing the ring Advarne later curses when Loki takes it from him. 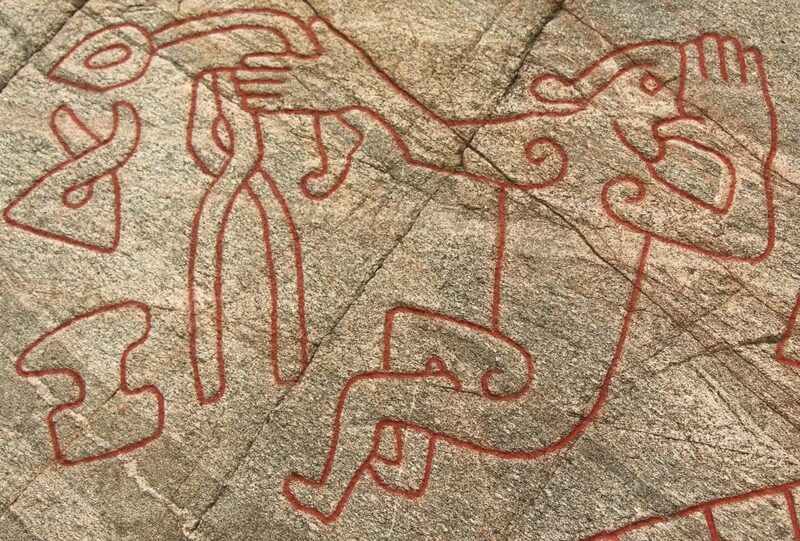 The legend of Sigurd –Siegfried in the German version — originated around the 5th century and spread throughout most of the Germanic-speaking world. The story is told in the epic poem Niebelungenlied, written in Middle High German around the year 1200 by an anonymous poet believed to be from the Passau region in southern Bavaria. Old Norse versions of the tale appeared in the collection of medieval Icelandic poems known as the Poetic Edda, as well as in the 13th-century Völsunga Saga. 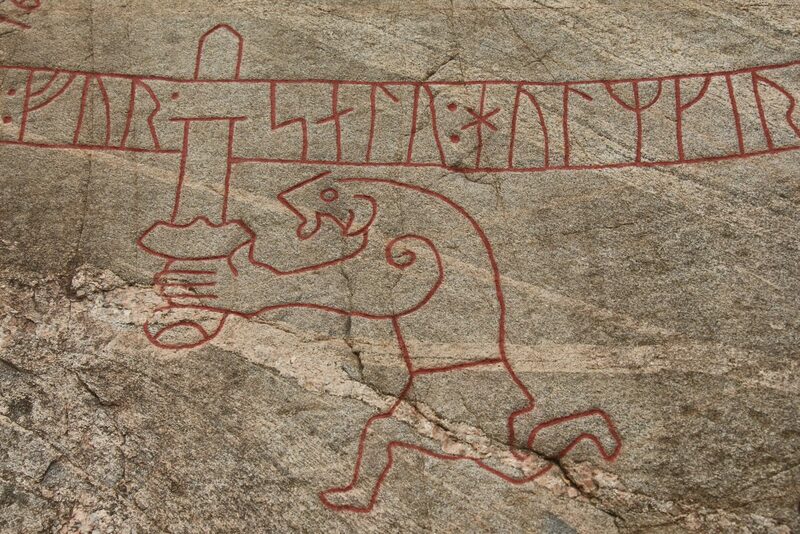 The portion of the legend told in the Ramsund Carving begins with Otter, one of the three sons of the wealthy dwarf Reidmar. Otter was able to take animal form and would often turn himself into an otter to fish for salmon. One day, while Otter was fishing, the gods Loki, Odin, and Hörnir passed by. Unaware of Otter’s true identity, Loki threw a stone at him and killed him. The gods brought the otterskin as a gift to Reidmar, who immediately recognized it as belonging to his son. Enraged, he demanded that the gods atone for their crime by covering the skin with gold. Not far away, there lived another rich dwarf, Andvare, who was also able to change into animal form. Loki managed to capture Andvare while he was in the shape of a fish and claimed the dwarf’s gold as ransom. Andvare tried to keep a single gold ring for himself, but Loki wrenched it from his hand, prompting Andvare to utter a curse on the treasure and especially the ring. 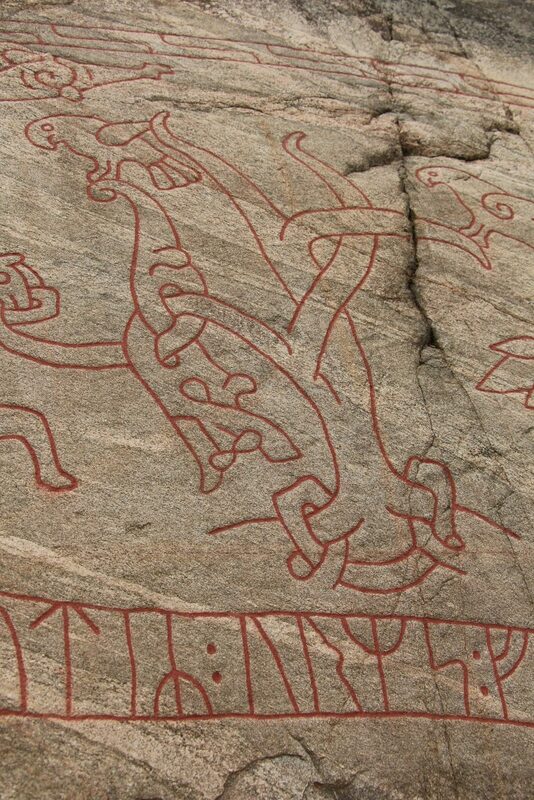 Wearing his armor, Sigurd stabs the dragon Fafnir from below. When Reidmar received the gold Loki had taken from Andvare, he refused to share it with his surviving sons, Fafnir and Regin. Enraged, Fafnir killed his father and claimed the gold. He brought it to a place called Gnitaheden and took the shape of a dragon to guard it. Fafnir’s brother, Regin, who was a skilled smith, also wanted a share of the gold and laid plans to obtain it through trickery. He called his foster son, Sigurd, to him and convinced him to try to kill Fafnir, promising him a share of the treasure. 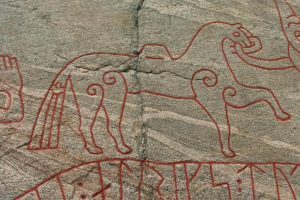 To aid Sigurd in his quest, Regin made him a sharp sword called Gram and gave him a horse named Grane, a descendant of the god Odin’s famous eight-legged steed Sleipnir. 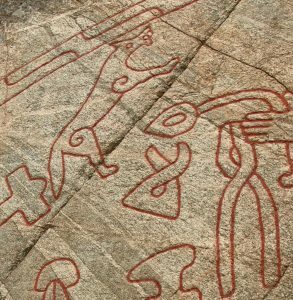 Sigurd went to Gnitaheden and dug a hole along the route Fafnir used when going to the nearby lake to drink. He hid himself in the hole, and when Fafnir passed over it, Sigurd stabbed his sword upward into Fafnir’s heart, killing the dragon. Sigurd sits naked by the fire, cooking Fafnir’s heart. He is sucking on his burned thumb and has turned his head to listen to the birds, whose language he can suddenly understand after tasting Fafnir’s blood. The birds in the trees tell Sigurd of Regin’s planned treachery. Regin had asked Sigurd to cook Fafnir’s heart so that he could eat it. As Sigurd was cooking the heart over an open fire, he accidentally burned his thumb. Putting the thumb in his mouth, he tasted some of Fafnir’s blood and was suddenly able to understand the sounds of the birds around him. They told him Regin wanted to eat the heart to gain Fafnir’s magical powers, and was planning to kill Sigurd. Taking the birds’ advice to kill Regin before Regin could betray him, Sigurd sought out Regin and cut his head off, then went to Fafnir’s home and retrieved the treasure. As the new owner of the treasure Sigurd was not immune to Andvare’s curse, and the violence and betrayal continue in full versions of the story. 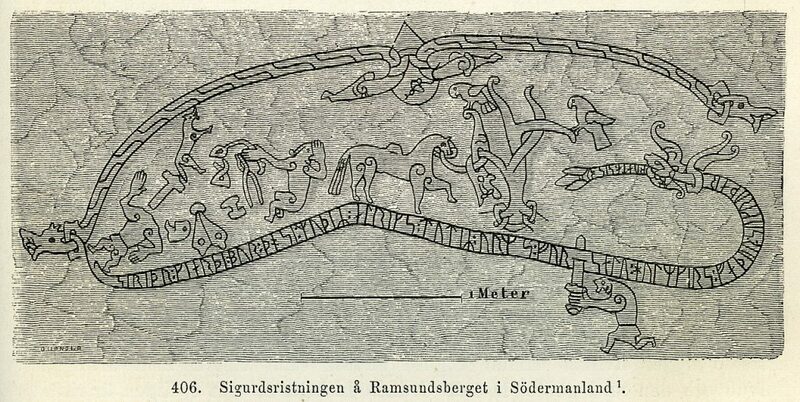 The Ramsund Carving, however, ends with the treasure loaded onto Sigurd’s horse, Grane. Regin lies dead, with his head chopped off, after Sigurd has killed him. Around him are tools of his trade as a smith. 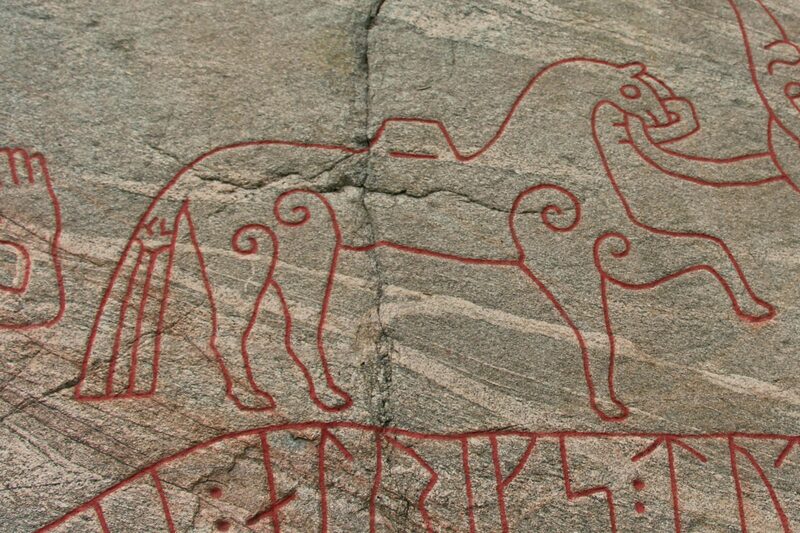 Sigurd’s horse Grane stands loaded with Fafnir’s treasure. 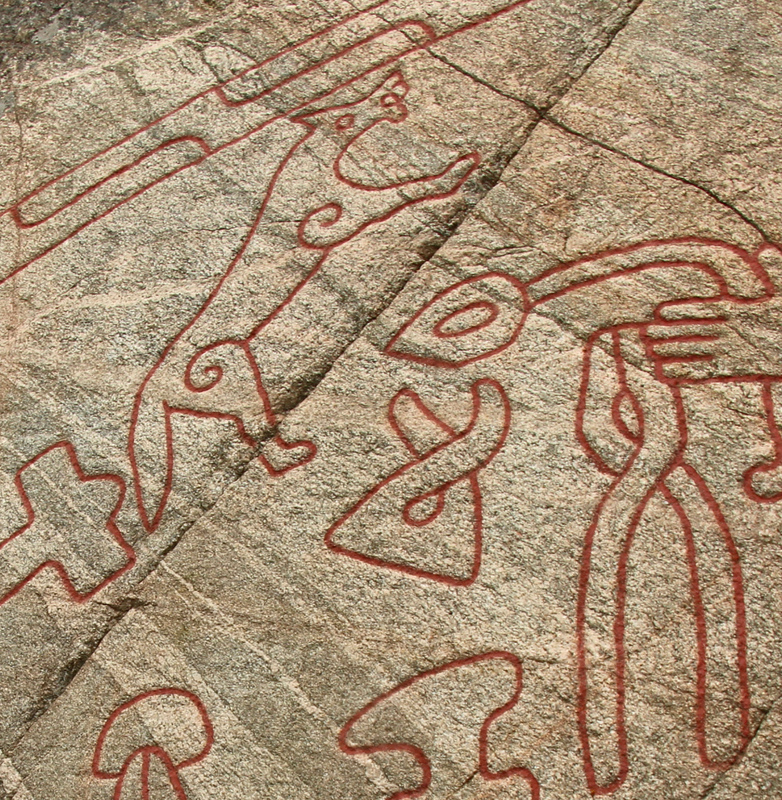 Unlike most of Sweden’s runestones, the Ramsund Carving emphasizes pictures rather than runic lettering. 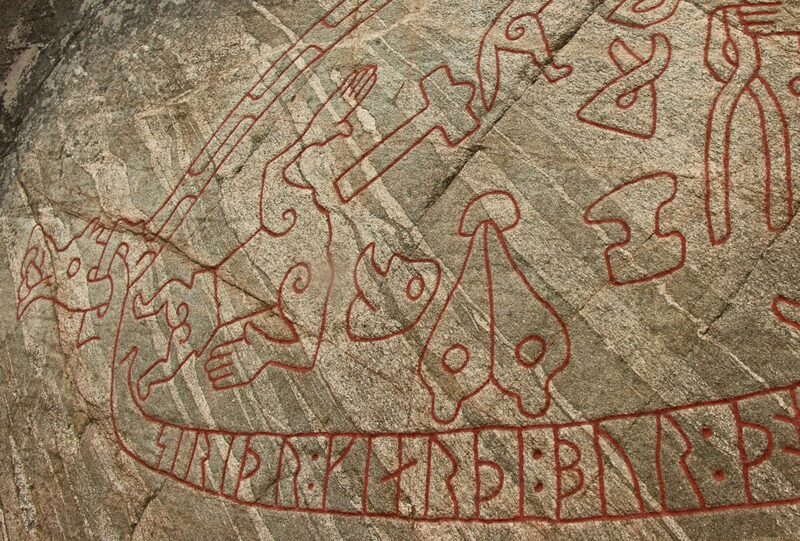 However, within the lower image of Fafnir there are runes that explain the carving’s origin. These letters read: “Sigrid made this bridge, Alrik’s mother [and] Orm’s daughter, for the soul of Holmger, Sigröd’s father, her husband.” It was common in the 11th century for people to build bridges for their dead, and to mention this in an adjacent inscription. Although the legend of Sigurd dates from pagan times, the fact that Sigrid built a bridge for her husband’s soul indicates that she was a Christian. 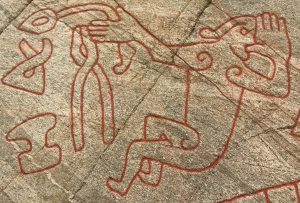 According to a description of the Ramsund Carving published by the Swedish National Heritage Board, medieval Christianity often absorbed pre-Christian legends, giving them a new spin by associating them with Christian heros. Sigurd’s killing of Fafnir may therefore have been compared to a Christian story such as the Archangel Michael’s battle with the Devil. The bridge Sigrid raised has not survived, though traces of it remain. An archaeologist who examined the site in the early 20th century determined that the bridge would have been about 65 meters (213 feet) long and made of wood. Water levels in Lake Mälaren were higher a thousand years ago than they are today, and the bridge would probably have spanned a waterway about three meters (10 feet) deep. 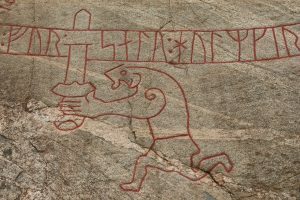 The carving is located along an unnamed road near Sundbyholms slott (Sundbyholm Manor), about 12 kilometers (7.5 miles) from Eskilstuna. Follow signs toward Sundbyholm and watch for signs indicating the way to Sigurdsristningen.